Do I really see this stuff on a daily basis? While I have talked about seeing these things daily, I must admit that I don’t actually see the things I write of every single day. I take weekends off. It is, in fact, a fact that I see the goofs, gaffes and greed of other repairmen every day that I’m in the field. I don’t nitpick. The things I write of are substantive and, if you’re not used to it like I am, very surprising. So prepare for the surprise as I present a very typical (work) week in the my life. Click the entries to expand. Click the pictures to enlarge. 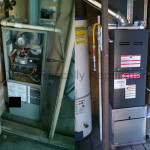 Goodfella Furnaces installed the furnace on the left. The living room is on the other side of the nearby wall. That means that the furnace’s blower is just inches away from the living space. It’s very loud. Had Goodfella, a large and well known company, spent a mere hundred bucks on a prefabricated pedestal the system would have been much quieter. The homeowner wasn’t even given the option. I installed the furnace on the right in the same development. You can see the pedestal underneath it. The soft surfaces that line the inside of the pedestal reduce noise significantly. I installed the same pedestal in a different home and measured the before and after sound levels. The pedestal at that location reduced noise by 9 dB. An unknown contractor seemed to be looking for ways to install this equipment wrong. 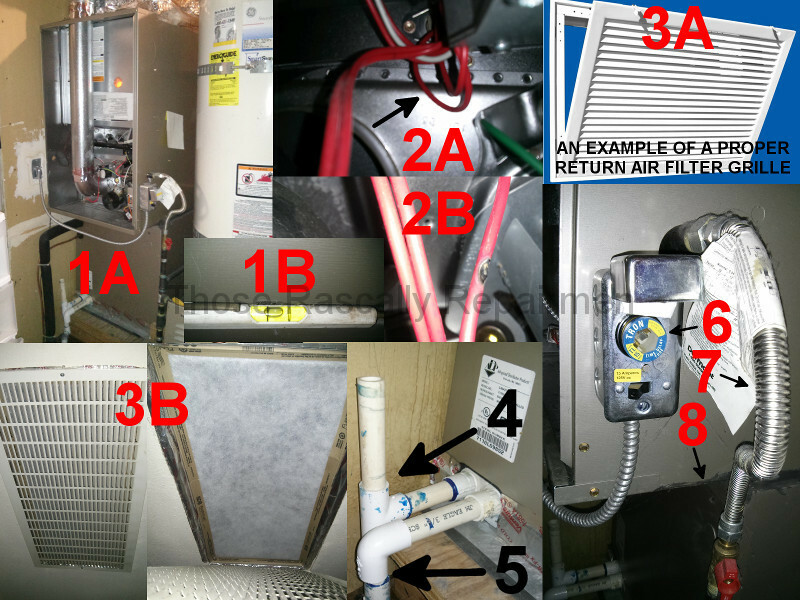 The following is a list of readily noticeable issues with the furnace and cooling coil. Had I dug deeper, or had I looked at the air conditioner outside, I’m sure I would have found even more problems. Click on the first picture below to see what’s described. 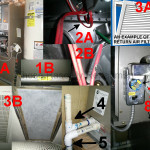 1) The furnace and cooling coil (A) are tilted back (B). As the years pass most systems accumulate a little sediment in their cooling coil drain pans. Normally that sediment doesn’t matter. But tilt the drain pan back and a little sediment may be enough to cause drainage problems and subsequent water damage. 2) The wiring (A) wasn’t tied down properly. That resulted in the burned wire (B) that precipitated the service call. 3) A proper filter holder (A) wasn’t installed. The homeowners incur cosmetic damage to the ceiling (B) every time they replace the air filter. 4) A p-trap wasn’t installed on the primary drain. 5) The secondary drain is not connected to anything and is pointed at the floor. 6) The fuse is the wrong type. 7) The flexible gas line is too small. 8) An excess flow shut off wasn’t installed. Some of those deficiencies, six through eight in particular, are code violations that may never manifest into a functional problem. Others just might. 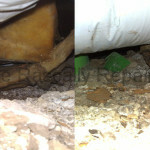 Drainage problems in particular can go unnoticed for quite some time before the damage becomes evident. This second picture shows what happens when water dripping into the duct below the furnace goes unnoticed for a long time. The bottom of the duct has rusted through and dropped down. Another day, another botched install. Wait a sec… this is the same day! In this case the unknown installer’s “cuts” are fewer but run deeper. Click on the picture below to see what’s described. 1) The installer didn’t run enough wires from the air handler (A) to the heat pump (B), thereby robbing the system of some basic functionality in the heating mode. As a result the system blows ice cold air when it’s in defrost mode. 2) The installer installed two 60 amp circuit breakers (A) rather than the 60 and 30 amp circuit breakers that are called for (B). 3) The service valve caps were loose. That could result in an expensive loss of refrigerant. 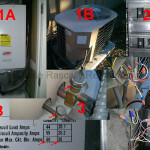 4) The control wiring at the heat pump is wrong in multiple ways. 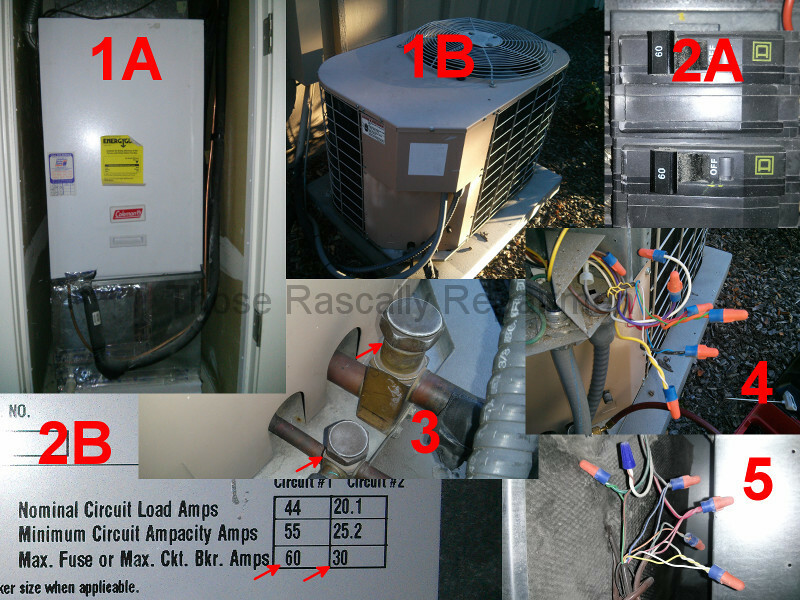 5) The control wiring at the air handler is also wrong in several ways. As furnace installations go, this one doesn’t look that bad. However, airflow through the system is very bad. The back pressure is 1.1″ WC, which is 50% higher than normal. As a result the system has been overheating for years. The homeowner was unaware of the overheating because the furnace’s safeties were masking the problem. It was never a fire danger, but the furnace’s service life has been shortened. 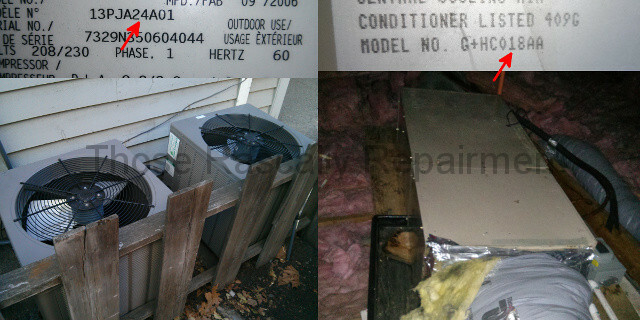 The air conditioner has also suffered accelerated wear. And of course energy efficiency is reduced. I didn’t find any damaged ducts that would explain the lack of airflow. As is the case with so many homes, the duct design itself is the problem. The ducts are just too small, so airflow is choked. 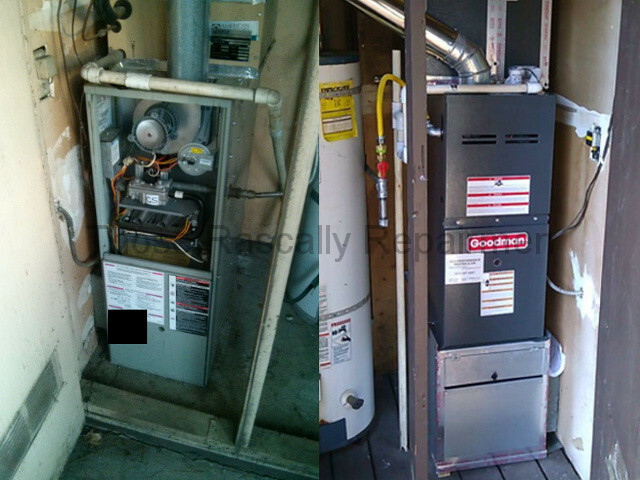 The property manager tells me that Green Monster Mechanical installed the two heat pumps pictured below. I won’t bother pointing out the minor flaws with the installation because the major flaw is a fatal flaw. The heat pumps are rated for 24,000 BTU’s. 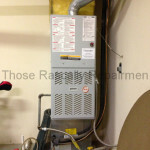 The much older air handlers that they’re connected to are rated for 18,000 BTU’s. You just can’t do that. 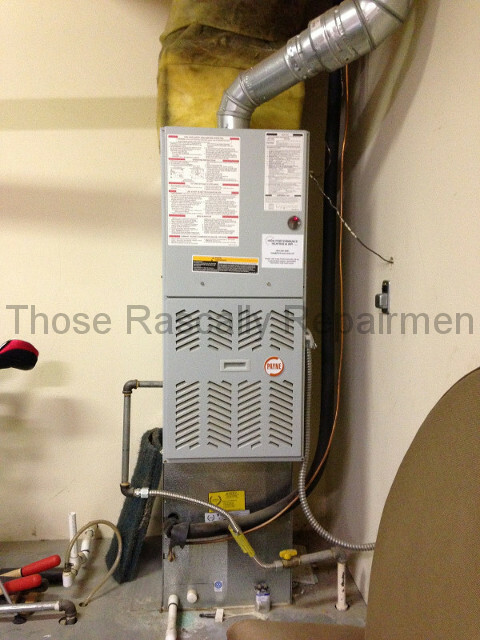 You can’t pair a larger heat heat pump with a smaller air handler. It never works. That’s HVAC 101. The mismatch has put the compressors in those heat pumps under a lot of stress. They’re noisy. And if nothing changes they will die a premature and very expensive death. The owner was unaware of the mismatch. All she knew was the tenants were complaining about noisy heat pumps. 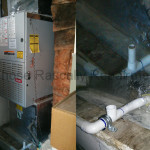 When they were called out to address the noise, Monster’s recommendation was to replace the heat pumps yet again. They’re only seven years old. Monster has yet to notice, or at the very least has yet to report, the mismatch they created. Installing higher end heat pumps might have quieted things down, but the underlying problem would have remained. Monster should have installed 18,000 BTU heat pumps to begin with. Since it’s too late for that, the best solution now is to install new air handlers that match the heat pumps. This isn’t hard to figure out. As you can see in the picture, the model number of the heat pump has a “24” in it. The model number of the air handler it’s paired with has an “18” in it. You just read what their BTU ratings are. I’m sure you can connect the dots. Why can’t Monster? They’re a five star rated company that’s been around for years. Update: About five months after I diagnosed the mismatch, the property manager approached Monster about rectifying the situation. They said they didn’t install the equipment. The owner hasn’t found the installation paperwork, so they’re at an impasse. Even if Monster didn’t perform the installation, they are kindred spirits with the mystery installers. When asked about the mismatch, Monster said that it’s fine. They’re still recommending new 2.0 ton heat pumps! There are occasions when I come across some truly unique furnaces. This is not one of those occasions. Carrier furnaces like the one below are a dime a dozen. The blower motor it contains is just as common. 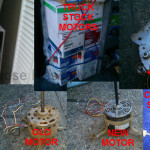 In fact, that motor is used in many different brands of furnaces. I carry two of them on the van. The new motor costs me a little less than $100. Abrasive Air correctly diagnosed a bad blower motor yesterday. They didn’t have one with them, but would have returned today. To be fair, I’ve been known to run out of truck stock myself. Their out-the-door price would have been $1,000. That’s not fair, at least not in my opinion. I don’t like criticizing other companies for their price, but there comes a time when enough is too much. 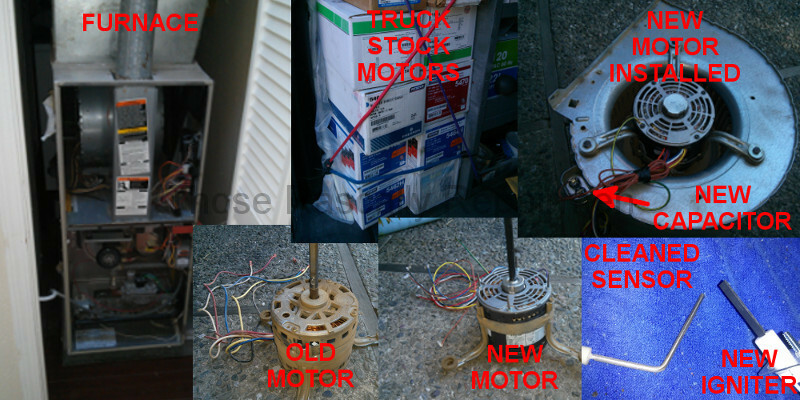 I replaced the motor, capacitor and igniter for a comparatively paltry $540. I also installed new air filters and cleaned the flame sensor. The entire process took less than two hours. The old saying “If it was a snake, it would have bit you.” certainly applied to this job. I was called out for what ended up being a bad igniter. That is one of the most common and mundane heating repairs. I pretty much went into autopilot. I certainly wasn’t thinking about air conditioning. So I nearly missed the obvious problem right beneath me. 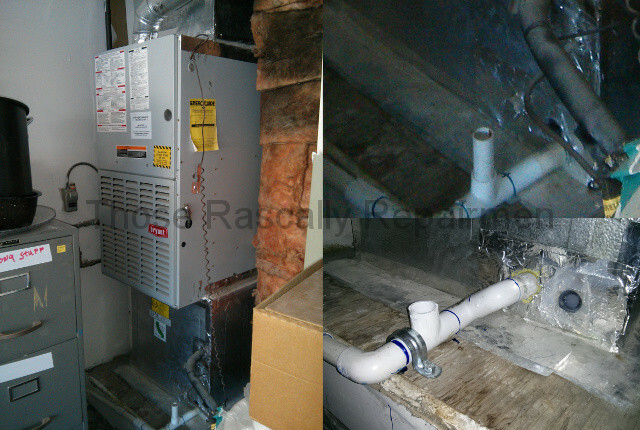 The top right section of the picture below shows the (white plastic) condensate drain line sitting on the platform. It used to be connected to the drain pan’s male fitting (black spot right above and slightly to the left of the drain line). The unknown installers had run the drain line straight off the drain pan and gave it no support whatsoever. It was only a matter of time before it got bumped, breaking off the plastic drain pan’s male fitting in the process. And that’s exactly what happened. The homeowner was completely unaware of the problem. It might have been spilling water onto the platform for years. 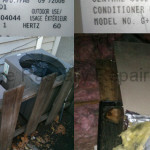 Most contractors would recommend replacing the entire coil for $1,500. Few would mention that you can replace just the drain pan for half that. And virtually no one would do what I did. I sealed the broken port with silicone (bottom right part of the picture) and connected the drain line to the secondary drain port. I then angled the drain line down and clamped it to the platform so that there’s no chance of it breaking off again. At worst my MacGyvered repair may leak a bit and the homeowner will have lost $40 for the attempt. At best I saved him a ton of money. But wait, there’s more! There really is. The source material is endless. The time I have to write is not. Of the thirteen service calls I ran this week, seven of them have an entry into this virtual hall of shame. That’s more than half and more than one per day. When it’s busier I run twice as many calls in the same number of days and see twice as many worthy of an entry. You have now seen what I continue to see on a daily basis.